Our gourmet Indian curry sauces are crafted with great care and passion to rival the taste and quality of those from the finest Indian restaurants. We make our curry sauces in small batches with fresh whole ingredients, not pastes or powders. Our sauces contain no artificial preservatives, gluten or fillers of any kind. You will not believe that they came from a jar – and your guests would never guess it. Our sauces have been rated “A+” by TasteGrader.com and SuperMarketGuru.com declared the Coconut Curry a "HIT". We are now available online at Amazon.com. See our locations page for a full list of stores that carry our product. 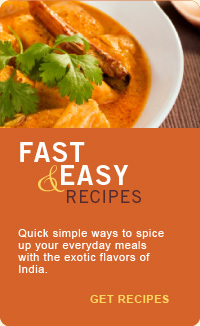 Make healthy, delicious and authentic-tasting meals in minutes, with Indian curry sauces proudly made in the USA. For creative ways to use our all natural Simmer Sauces, see our Recipes Page.